Your CV is the first thing an employer sees when they check your application. If your resume has a photo of you in it, this is in a way an introduction which helps the employer to form an idea about you even before the interview if he/she ever decides to invite you to one. The choice of a picture can significantly influence this idea in a positive or a negative way. That is why choosing the right photo is very important and it has nothing to do with the way you actually look. To be sure you are on right track here are some simple rules to follow. Great advise is to pick a passport type photo – head and shoulders view and with the camera on the level of your eyes. Of course, unlike in your ID photo, you don’t have to be so serious – a delicate smile will in fact create positive emotion in the person checking your resume and will also make you look more amiable. However, don’t overdo the smile – showing too much teeth might leave the impression that your are not serious and reliable enough. 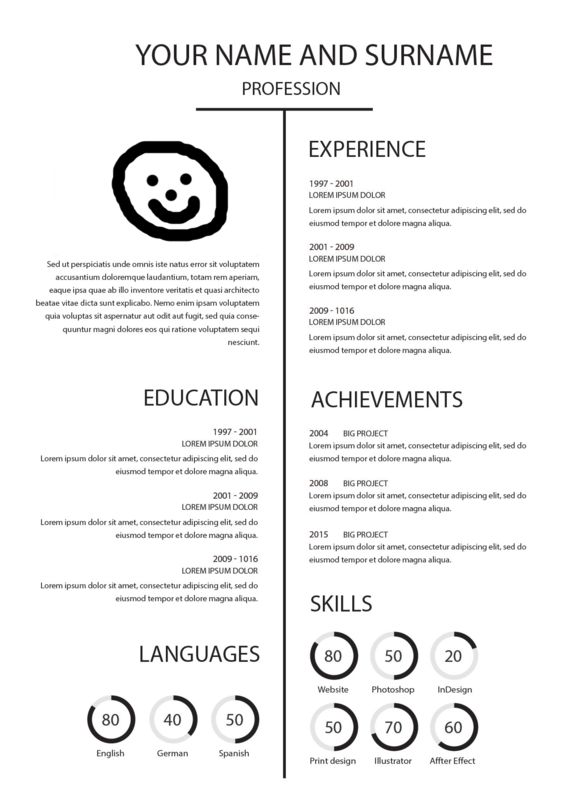 Another must for your CV picture is high quality and good lightning. Any pics you snapped with your phone the previous night in the kitchen are only appropriate for your Facebook profile. If you don’t have the condition for a high quality picture at home, go to a professional studio – it won’t cost a lot and the result will certainly be worth it. Choose smart clothes for your resume picture – there is no need to wear a suit and a necktie – a shirt or a blouse in a neutral color will do the job. Ladies should forget showing bare shoulders because they might create unprofessional associations. And don’t even dare opening the folder with your prom photos, no matter how awesome you looked and how stunning your hairdo was. Pictures from family reunions, weddings and other life-changing events should stay in your home album as well. What the employer wants to see in your photo is what you look like in a professional environment, so don’t pick a photo you will share with friends in order to show them how good you are at windsurfing or rock-climbing. Under no circumstances should you put in your resume a photo where you wear a hat or sunglasses. This is not a movie poster, so forget creativity and originality. The employer wants to see you, not your awesome Gucci glasses. Along with the rule that you should keep your family photos in your family album, there is a rule that you should avoid including in your resume photos in which there are other people (and/ or pets). After all, the employer shouldn’t be wondering which exactly in the picture is you. Besides, photos like these show you don’t really care about the job that much. You don’t want them to think you are not interested and motivated enough even before they saw you, do you? Following the same logic, avoid pictures where you cropped out your buddies with Microsoft Paint. This also shows neglect on your part because you definitely have a picture with only you in it. If you really don’t, consider again the proposal about visiting a professional studio. Same rules apply for your LinkedIn profile picture. Your look there should also be smart and business-like since it is likely that your future employer will be checking you there (and even on Facebook) after he/she received your resume. The right choice of picture may not be enough to get you that job interview, but it will definitely work to your advantage. Don’t forget that!